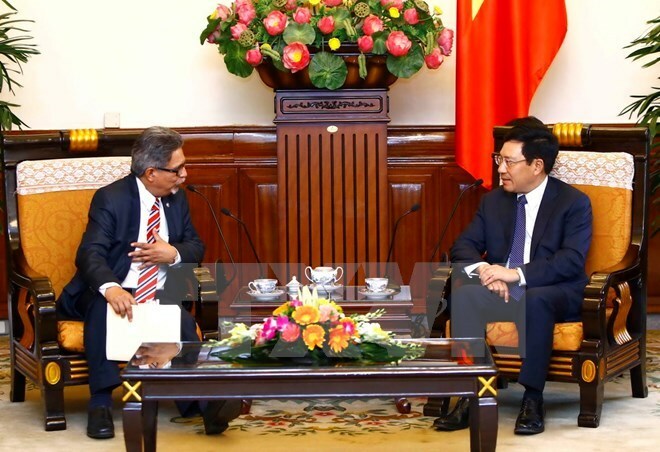 Hanoi (VNA) – The first deputy foreign minister-level political consultation between Vietnam and El Salvador took place in Hanoi on August 28, aiming to seek measures to foster the partnership between the two countries and their foreign ministries. Co-chairing the event, Deputy Foreign Minister Ha Kim Ngoc and his Al Salvador counterpart Carlos Castanedaagreed to continue maintaining and enhancing the effectiveness of the consultation between the two ministries. The two sides will support Vietnamese and El Salvador enterprises to access each other’s market and set up direct partnerships, contributing to raising two-way trade. They agreed on the huge cooperation potential between the two countries, especially in education, transportation, oil and gas, construction materials, agro-fishery production and processing. Vietnam and El Salvador will continue implementing the signed agreementsand speeding up negotiations for other deals in transportation, technology, education, science and culture to continue completing the legal framework for bilateral collaboration. The two sides also shared views on many international and regional issues of mutual concern. Later the same day, Deputy Prime Minister and Foreign Minister Pham Binh Minh hosted a reception for Deputy Foreign Minister Carlos Castaneda. Minh expressed his pleasure with the fruitful outcomes of the first political consultation between the Foreign Ministries of the two countries, as well as the growing friendship between Vietnam and El Salvador, particularly between the Communist Party of Vietnam and the Farabundo Marti National Liberation Front. Lauding El Salvador’s opening of the Consulate Office in Ho Chi Minh City, the Deputy PM said he hopes that the two countries will continue working closely with and support each other at international organisations and multilateral forums, especially the United Nations and the Forum for East Asia-Latin America Cooperation (FEALAC). On the occasion, Minh conveyed the Vietnamese leaders’ invitations to El Salvador President Sanchez Ceren and Foreign Minister Hugo Martinez Bonilla to visit Vietnam. For his part, Carlos Castanedaspoke highly of Vietnam’s comprehensive renewal achievements over the past more than three decades, noting that his ministry wishes to contribute more to boosting all-round ties with the Southeast Asian country. Within the framework of the visit from August 28-29, El Salvado Deputy Foreign Minister Carlos Castaneda also had meetings with Deputy Minister of Culture, Sports and Tourism VuongDuy Bien, Deputy Minister of Industry and Trade Do Thang Hai, Deputy Minister of Agriculture and Rural Development Le Quoc Doanh and Vice President of the Vietnam Union of Friendship Organisations Don Tuan Phong.